NEXT MOROCCO SURF TRIP : from 25th to 31th March 2018 ! Surf trip lover, get your back pack ready! 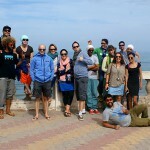 -Morocco Surf Trip- is a package for the adventurer that is hiding inside each and every one of you. 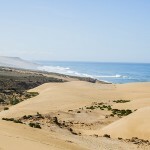 From Tamraght, you will travel along the coastline with the region’s best surf guide to discover wild landscapes and empty spots “searching for the waves!” Southbound : Mirleft, Legzira beach with the beautiful red arch, Sidi Ifni. 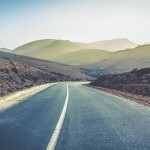 Northbound : Imsouane, Tafdna, Iften, La grotte, Sidi Kaouki, Essaouira. You will be staying in different hostels and you may taste the best tajines and couscous of your life. Yallah, let’s explore the ocean! If you head south from Agadir, Morocco towards Sidi Ifni, just 10km out you’ll find this amazing place where nature shows off her beauty and the water and wind have carved the majestic red stone arches than extend along this sandy beach. It’s quiet her, not very touristic …you can really feel the sound of the ocean and it transports you to another world. It’s known among nature lovers and surfers, not only for its beauty, but also for its friendliness. The few hostels in the area have only been serving tourists for a short while. If you choose to stay here for a while, you won’t forget the feeling of the red mountains bathed in the roar of the surf. The colors of in the morning and at sunset are unique and unforgettable. 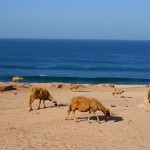 Along Morocco’s southern coast, past the European throngs that fill Agadir is calm, quiet, and secluded Sidi Ifni. Driving along the coastal highway, you will definitely not want to skip Tiznit. 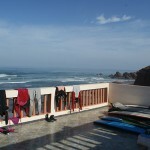 But if you have only got a few days to travel to the Souss region of Morocco, then pull yourself away to spend a few days surfing in Sidi Ifni area.The main wave is a long righthand wall breaking over boulder type rocks way on the outside. 2 lefts and the town beachbreak complete the panorama on the “promenade”. 2km to the south, a righthander breaks off the end of the harbour wall that protects an inside left when big. If you want to organise a nomad surf trip with your friends as a specifics dates, we can do it! Book now your nomad surf trip !